It’s been a bad few years for homeowners around the country, and those in greater Philadelphia are no different. But people who owned houses in Philadelphia’s center city or suburban areas near a walkable town center fared better than others. 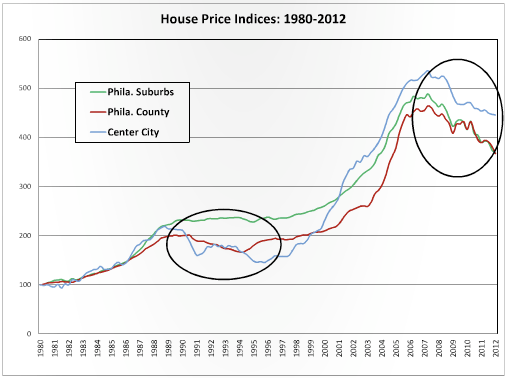 During the first housing downturn of 1989-1995, housing prices declined the greatest in the urban core center (-33.7% in the center city), second-most in the central city of Philadelphia as a whole (-17.6%) and least in the lower-density areas of the suburban counties (-14.3%). But during the most-recent housing downturn of 2007-2012, home price declines have been the greatest in the low-density suburbs (-32.7%), second-most in Philadelphia County (-26.7%) and the smallest in the urban core of the center city (-20.2%). The study evaluated the urban character of each zip code in the region, using criteria like housing density, transit accessibility, mix of land uses and other indicators. This method was employed to examine the relationship between urban form and the housing market, instead of using crude measurements like the political boundaries between suburbs and the city. The authors attribute the new dynamic to rising energy prices, as well as the revitalization of central city Philadelphia and shifting housing preferences, especially among seniors and young people. The findings are consistent with other studies that have found walkable, transit-accessible places have bounced back stronger from this housing downturn than more car-centric areas.